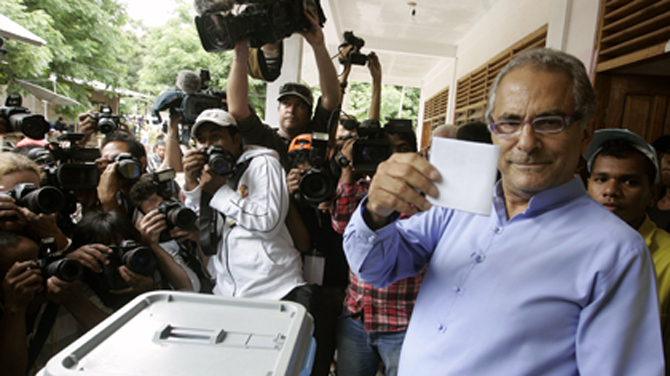 DILI, East Timor—President Jose Ramos Horta, who campaigned tirelessly for East Timor's independence for more than two decades and then went on to help steer the new nation, conceded defeat on Monday after a poor showing in weekend elections. The official results from the first round of voting will not be announced until Tuesday. But with more than 70 percent of the ballots counted, the Nobel laureate had nowhere near the support needed to advance to an April 21 run-off. The two leading candidates are Francisco “Lu Olo” Guterres, of the traditionally strong leftist Fretilin party, and former military chief Taur Matan Ruak. He promised to hand over power peacefully to the winner on May 19. Ramos Horta spent more than a quarter of a century in exile, tirelessly campaigning for East Timor's independence from brutal Indonesian rule by lobbying governments around the globe. He and his fellow countryman Bishop Carlos Belo were rewarded for their efforts in 1996 with a Nobel Peace Prize. After the new nation was born in 2002, Ramos Horta served first as foreign minister, then shepherded East Timor through turbulent and often violent times as prime minister. In 2007 he became president. He was wounded in an assassination attempt, but returned quickly to work. East Timor's transition to democracy has been a rocky one. Its leaders have battled massive poverty, social unrest and bitter disputes between soldiers and police that—just a few years ago—left dozens dead and resulted in widespread looting, arson and gang warfare. With the future of the tiny nation in doubt, UN and Australian troops were deployed to restore order. If the situation on the ground remains calm, they are scheduled to be out by the year's end. According to preliminary results from the weekend elections, Guterres took in 28 percent of the vote, Ruak 25 percent and Ramos Horta 17 percent.